On December 8, 2006 (Feast of the Immaculate Conception), Mel Gibson released his epic movie, Apocalypto . Hopefully many eyes were opened by this movie’s portrayal of the evil of human sacrifices practiced by the Aztecs and other Indian cultures in what would become Mexico. The movie provides the historical backdrop of today’s Marian celebration: the Memorial of Our Lady of Guadalupe, the 480th anniversary of Mary’s appearance to St. Juan Diego. One of the last scenes in the film is the sight of the ships of Hernando Cortez of Spain — black crosses on their sails — landing on the beaches. What most viewers of Apocalypto probably do not know is that Cortez lands on Good Friday, April 22, 1519. This begins a remarkable story that culminates with Our Blessed Mother’s appearance to St. Juan Diego on December 12, 1531. It is my hope and prayer that Gibson’s film reminds people why Cortez needed to stop the practice of human sacrifice and bring knowledge of the True God to the indigenous people of Mexico. Our culture, in which Satan has convinced many of our people that slaughtering their most innocent citizens in their mother’s wombs is a basic human right, needs such wake-up calls. No will ever know exactly how many were sacrificed, but the law of Aztecs required a thousand to their god Huitlopchtli, the god of death, sun and war in every temple every year. Historians tell us there were 371 temples when Cortez arrived. There were other ritual sacrifices as well to other gods. One Mexican historian estimated that one out of five children was sacrificed. Sometimes entire tribes were exterminated by sacrifice. Month after month, year after year, in temple after temple, sacrificial victims came down the long roads leading to the pyramids, climbed the steep steps to the top of the platforms, were bent backwards over convex slabs of stones. An immense knife with a blade of midnight black volcanic glass rose and fell, gutting the victim open. His or her heart was torn out while still beating and held up for all to see, while the ravaged body was kicked over the edge of the temple where it bounced down the steps a hundred feet below. This scene is graphically portrayed in Apocalypto. Satan is more clever today, taking the sacrifice inside “medical facilities” and disposing of the carnage behind closed doors. But since 1973, 43 million babies in this country have been sacrificed through abortion. Outside of the resurrection of Jesus Christ, I can think of no more miraculous story than that of Our Lady of Guadalupe. 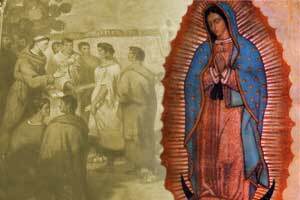 If ever there was a story to renew a weary faith or convert a lost soul, the story of St. Juan Diego and Our Lady of Guadalupe is just such a one. The miraculous image of Our Blessed Mother appeared on the tilma (cloak) of a poor Mexican peasant named Juan Diego in the year 1531. By all rights, the coarsely-woven tilma made from cactus fibers should have disintegrated after twenty years. Not only is the image itself beyond all scientific explanations, but the fact that the tilmais still intact after nearly 475 years and hangs today in the Basilica of Our Lady of Guadalupe in Mexico City, is itself a miracle. It is through this vision and image that nine million Aztecs turned to Christianity by 1540 and tens of millions more within twenty years. An incredible list of miracles, cures and interventions are attributed to her. Yearly, an estimated 20 million visit her Basilica, making her Mexico City home the most popular Marian shrine in the world, and the most visited Catholic Church in the world next to the Vatican. On this very day at the Basilica in Mexico City and throughout Mexico the processions and rosaries said will be in the tens of millions. In all, twenty-five popes have officially honored Our Lady of Guadalupe. His Holiness the late John Paul II visited her sanctuary four times: on his first apostolic trip outside Rome as pope in 1979, and again in 1990, 1999 and 2002. For years, my wife Patti and I dreamed of venturing to Mexico to see the miraculous image of Our Lady of Guadalupe. So for our twenty-fifth wedding anniversary, we flew to Mexico City along with eight of our children. (Our sons from Kenya have travel restrictions and were unable to make the trip.) Our visit to the shrine would come at the end of our vacation. First, we took a three-hour breathtaking (and hair-raising) drive to spend a week in the small colonial town of Taxco with cobblestone streets and seven beautiful Catholic churches. Interestingly our villa was located on Guadalupe Street and the church overlooking us was the Church of Guadalupe. On the morning of June 19th, we walked down cobblestone streets to Vera Cruz Church (the Church of the True Cross) where Fr. Guadalupe blessed our marriage and family during a Mass said in Spanish. We learned that Father Guadalupe was named thus by his mother because he was born on December 12th, the Feast of Our Lady of Guadalupe. In Taxco the consecration of the Eucharist is hailed not only with bells at the altar but with the sound of fireworks discharged outside the Church so people throughout the city will know Christ has arrived. Through our travels to other tourist sites and many conversations with locals, it was clear that Mexico truly has a Catholic heart that reaches far beyond the insides of churches. Jesus and their beloved Lady of Guadalupe are represented and talked about everywhere. After a week of climbing steep cobblestone streets, carefully navigating restaurants and open-air markets for meals, and bargaining with street vendors for souvenirs, we returned to Mexico City. The day had finally arrived for our pre-arranged guide and tour. We would visit several sites in Mexico City, including Tlaltelolco, where, in 1521 Hernando Cortez defeated the Aztecs in the final battle that put an end to the Aztecs’ pagan rituals and human sacrificing; the Pyramid of the Sun and Moon at Teotihuacan, where the Mayan civilization flourished in 150-450AD; and finally the Basilica of Our Lady of Guadalupe. Of all the appearances of the Mother of God since the resurrection of her Son, only this one has been accompanied by the sacred image of Our Lady. For those who are unfamiliar with the story of the sacred image, I will recount some of the details. Juan Diego, a Nahuatl Indian, was a widowed convert to Roman Catholicism on his way to Mass on December 9, 1531, the solemnity of Mary’s Immaculate Conception. For several years Juan Diego, then in his mid-fifties, got up before dawn and walked fifteen miles, one way, to attend daily Mass. As he passed by Tepeyac Hill, the sky became bright and he heard singing on top of the hill, like the songs of various birds. Juan Diego rushed the final miles on foot and waited for hour to see Bishop Zumarraga. The friars were reluctant. After all, Juan Diego was a poor Indian with sandals, a walking stick and no appointment to see the bishop. After waiting patiently, Juan Diego was finally ushered in. When he related his story to Bishop Zumarraga, Juan Diego, through a translator, was told that he needed a sign to prove that this account was true. A series of other events happen to Juan Diego over the next three days that would take too long here to explain, but then on December 12, 1531, Mary provided a sign that convinced the bishop that Juan Diego spoke the truth. When Mary appeared to Juan Diego that day, she directed him to pick Castilian roses from the top of Tepeyac hill, and to gather them in his tilma to present to the bishop as proof of her miraculous presence. (Castilian roses were not common in Mexico City in 1531, and certainly not in the dead of winter.) Juan Diego did as he was asked and the Blessed Mother even helped him lay the flowers in his tilma. When Juan Diego returned to the bishop and opened his cloak to show the roses, the bishop and all those present were amazed and fell prostrate. The image of Our Blessed Mother was emblazoned on the tilma. The image was far more than a mere picture of a beautiful lady. Her dress and manner told a story that all the Aztec Indians could understand. Below are just a few of the highlights of the symbolism. Her hands are folded in supplication; her posture indicating that she is interceding for us at the throne of the God. The luminous light surrounding the Lady is reminiscent of the “woman clothed with the sun” of Revelation 12:1. The rays of the sun would also be recognized by the native people as a symbol of their highest god, Huitzilopochtli. Thus, the lady comes forth hiding but not extinguishing the power of the sun. She is now going to announce the God who is greater than their sun god. The Lady is standing upon the moon. Again, the symbolism is that of the woman of Revelation 12:1 who has the “moon under her feet.” The moon for the Aztecs was the god of the night. By standing on the moon, she shows that she is more powerful than the god of darkness. The eyes of Our Lady of Guadalupe are looking down with humility and compassion. This was a sign to the native people that she was not a god since in their iconography the gods stare straight ahead with their eyes wide open. The angel supporting the Lady testifies to her royalty. To the Aztecs only kings, queens and other dignitaries would be carried on the shoulders of someone. The mantle of the Lady is blue-green or turquoise. To the native people, this was the color of the gods and of royalty. The stars on the Lady’s mantle show that she comes from heaven. The gold-encircled cross brooch under the neck of the Lady’s robe is a symbol of sanctity. The girdle or bow around her waist is a sign of her virginity, but it also has several other meanings. The bow appears as a four-petaled flower. To the native Indians this was the nahui ollin, the flower of the sun, a symbol of plenitude. For them, this was the symbol of creation and new life. The high position of the bow and the slight swelling of the abdomen show that the Lady is with child. So by her dress, the image shows that Mary is of royalty from heaven and was both a virgin and “with child.” Thus, the image of Our Lady of Guadalupe, the patroness of the Americas, has become a powerful symbol for the pro-life movement. In modern times, intensive study has been made of this image. Richard Kuhn, Nobel Prize-winner and chemist, examined two fibers from the image and subjected them to a multitude of tests. He announced there was no paint of any kind on the fibers. Whatever materials were used to produce the color are unknown to science, being neither animal, vegetable or mineral dye. Infrared photography confirmed that the image was not drawn or painted; there are no strokes. In 1955, it was discovered under a high-powered magnifying glass that in Mary’s eyes, the reflection of a bearded man in the pupil of the right eye could be seen, similar to what is seen in the eyes of photographed subjects. Further investigation has revealed the reflections of people in the eyes that appear to be standing near a bearded man with one person looking over his shoulder. These images were compared to a sketch of the scene of Juan Diego presenting the tilma to the bishop which was drawn in 1533. The people in the sketch were standing in the exact position as the images in Our Lady’s eyes. On the day our family arrived at the basilica, tens of thousands of people were coming to a special Mass that day for the spiritual healing of Mexico, but we managed to get within several feet of the image. A “moving sidewalk” takes visitors past the miraculous tilmaso as to keep traffic moving and allow a reasonably close view. I wanted to bring back home a life-size reproduction of the nearly 6-foot-tall image, so I asked our tour guide where I might find one amidst the myriad of souvenir shops that lined the grounds of the Basilica. He told me of one store that might have something. We were ushered to a shop under the Shrine that carried more objects than you could imagine. I asked the clerk if she had anything that closely resembled the actual tilmain size. She smiled and asked me to wait for a moment. After I returned to Bismarck, I felt that the picture was far too precious to serve as mere décor in our home. I decided that I would offer to give talks to school and church groups, so others can learn of this incredible story and enjoy the beautiful image. I combine PowerPoint presentation with the “tilma” and a talk. Jesus sent his Mother once to triumph over the serpent-god that the Aztecs, Mayans and other Indians were worshipping, and to put an end to the brutal human sacrifice that was being practiced. We can surely trust that Our Lady will intervene for us today and overwhelm the darkness with the brightness of her presence once again. On this memorial of Our Lady of Guadalupe, let us pray for her intervention to bring an end to the deadly errors in our society. Hail Mary, full of grace!